Ten-year-old Joey Wright was sitting in what felt like an eye doctor’s chair waiting for his new pair of glasses. There had been something wrong with his eyes and Dr. Chandler had to do an operation. He had to stay in the hospital and wear bandages over his eyes for six-weeks, which was pretty lousy because he couldn’t see anything, so he couldn’t do stuff like watch TV or play video games. But Mom said that before the operation, his eyes were really, really bad and that it would all be worth it when he got better. Funny though that he couldn’t remember very much from before the operation. Rhonda Chandler was one of the top ten ophthalmologists in the nation and the fees she charged would normally have made it impossible for Joey’s Mom Janis Wright to be able to afford her services. But Joey’s case was unique, marvellously and terribly unique. So Dr. Chandler agreed to take the boy on as a patient for whatever Ms. Wright’s medical insurance would provide. The real payoff for Chandler was to work with a person who had one-of-a-kind eye structure and to finally utilize the experimental lens material she had developed. He giggled as her fingers fumbled over his face. He could hear her lab coat rustling and then a kind of metal or plastic snapping sound. She sounded really serious, almost mad and that made Joey feel scared. She rubbed his face one more time and then he felt her slipping the glasses on him. He could hear her footsteps on the tile floor as she walked away. Then he heard a soft click. He blinked and then kept his eyes open. The room was really dim but he could see Dr. Chandler standing by the door. “A surprise?” Dr. Chandler was smiling as she opened the door and Joey didn’t have to guess very hard about what the surprise was. “Mom!” He almost jumped out of the chair but the Doctor motioned him to stay seated. Instead his Mom walked quickly over to her only child and hugged him. “Oh my baby boy! You can see again. I’m so happy.” Then she started crying. Joey started crying too and almost took his glasses off to wipe his eyes but then he heard Dr. Chandler. Ms. Wright looked up indignantly and started to talk, but then something about the expression on Chandler’s face stopped her. He took the tissue from her hand and did what she told him. “I promise, Dr. Chandler,” his Mom said. Joey’s Mom and Dr. Chandler had no false illusions. As much as Joey meant it at the time, they both knew he was still a ten-year-old boy and that sooner or later, he would forget and take his glasses off. Not a lot of kids wore glasses anymore, and they were afraid someone might bully him and knock them off or that he’d drop them at school during recess. While Joey had been in the hospital, Mom moved them into his Aunt Amy’s place. Aunt Amy was divorced and owned a small software company. That, plus the settlement she’d gotten from Uncle Dustin, or his ex-Uncle now, let Aunt Amy live in a nice, big house. Mom was a software developer and Aunt Amy let her work for her company from her house so she could home school Joey. Joey remembered Mom, Aunt Amy, Uncle (now ex-Uncle) Dustin, Grandma and Grandpa, and some other relatives, but he didn’t remember what he actually did and what life was like before the operation. Dr. Chandler said that he’d lost some of his memory because of the operation, but the important thing was that with the glasses, he could see just fine again and that his Mom would take good care of him. He loved his Mom very much and she loved him more than anything. He also loved Aunt Amy and his Grandma and Grandpa too (though they lived in another state and couldn’t come to visit very often). The one person he couldn’t remember was his Dad and it bothered him a lot. Whenever Joey asked about him, Mom changed the subject. Where was his Dad? If he divorced Mom like ex-uncle Dustin divorced Aunt Amy, why didn’t he visit? If he couldn’t visit because he was far away, why didn’t he call or text? It took a while, but Joey finally got into a routine. Every morning when he woke up, his room was blacked out, just like it was when he went to sleep. He took off his face mask which was like a blindfold that strapped around his head, and put on his glasses, which always sat in their case on the night stand next to his bed. Then he reached over to turn on the lamp. He had to take baths because it was too hard to wear glasses in the shower. When they fogged up because of the hot water, he’d use a special cloth to wipe the lenses, making sure to keep them on as he reached under them to do the wiping. Joey did schoolwork at home and even though he learned a lot, it was kind of lonely with no other kids to talk to or play with. Sometimes Mom took him on “play dates” with one or two other kids she said were his friends before the operation, but he didn’t remember them. They were really nice but Joey could tell there were things they didn’t want to talk about from before and sometimes they even acted a little scared of him. Their parents and Mom never let him be alone with the other kids, even for a minute. Everyone acted friendly and nice, but Joey knew they were holding back something, like they had a secret about Joey they couldn’t tell him. He got to go to movies, play video games, go to the beach in the summer and build snowmen in the winter, but except when he was sleeping, Mom never let him be alone, like she was afraid that sooner or later, he’d take the glasses off and try to look at the world without them. She was rinsing the dishes after dinner and then passing them to him so he could load the dishwasher. Aunt Amy was in her office upstairs talking to a contractor all the way across the country on Skype. His Mom froze for a split second as if caught by surprise and then kept on rinsing the cup she was holding. He normally wasn’t this rude to Mom, but the secret thing had been bothering him for a long time and he really wanted to get it settled. She put the cup in the sink, turned off the water, and then wiped her hands dry on a dish towel. “Honey, I know it’s been hard not remembering a lot of things.” She put her hands on his shoulders. He realized he wasn’t that much shorter than she was anymore. He saw her face get really pale. It made him nervous because she looked so frightened for a second, like she was scared of him. He murmured into her shoulder. “From what, Mom?” The hug felt nice and maybe that’s what he needed but needed some answers, too. “Well, Santa Claus and the Easter Bunny are fun to believe in when you’re a kid and where babies come from is well…you know…embarrassing.” He realized he was looking down at his shoes and his face was hot which meant he was blushing. He looked at her. 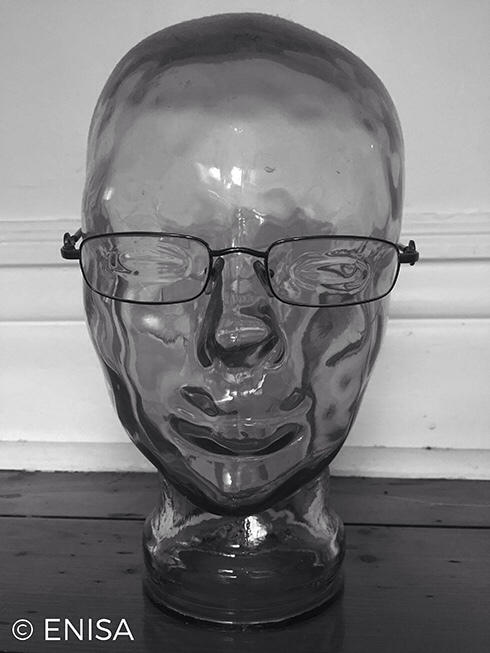 The glasses let him see every detail of her face and the roots of the parts of her hair that were grey. She’d probably dye her hair again soon. She wore contact lenses and he could see how the light reflected off of them, so he could tell what was the lens and what was her eye. She was sweating a little, probably because she’d been rinsing with hot water, but maybe she was also nervous. She smiled just a bit and she had that look on her face she got when she wanted him to trust her and not keep bugging her with questions. “Okay, Mom. I love you.” He hugged her again and she hugged back. It was Saturday morning. He took off the face mask but hadn’t put on his glasses yet. The room was completely blacked out so he couldn’t see a thing but he’d memorized the room a long time ago and could find his way around. He sat at the edge of the bed facing where he knew the window was. He could walk right over to it and open the blinds. He always did it in the dark anyway. He could do it right now without his glasses on. What were Mom, Aunt Amy, and Dr. Chandler afraid he’d see? Joey couldn’t do it. He wanted to but he’d promised. Besides, what if he looked at the world without his glasses and something horrible happened to his eyes, something Dr. Chandler couldn’t fix? It would be a stupid, stupid thing to do. But he wanted to do it so badly. After Joey got the operation, he was examined by Dr. Chandler once a day for the first week, and then once a week for four weeks after that. Then he didn’t have to see her again for three whole months. After being on that schedule for a while, he went to seeing her only once every six months, like when he went to the dentist. Joey had his last exam month ago so he wouldn’t need another one for five whole months. That’s when he started seeing the shadows. For a long time, Joey thought they were like how everyone thought they saw people or things out of the corner of their eye, so he figured it wasn’t worth telling Mom about (he was supposed to tell her if he saw anything strange or weird so she could make an emergency appointment for him with Dr. Chandler). The change happened so gradually, it took Joey a while to figure out things were actually getting worse and that the shadows weren’t just tricks being played by the light. He was seeing…something. Somethings, really. Most of the time they really did look like shadows, people’s shadows, but instead of being on the wall or floor, they were standing up and walking around. He couldn’t see any details, like exactly what shape they were, if they were men or women, or anything like that. He just saw fuzzy shadows that he could sort of see through. Once, right after he put his glasses on in the morning and opened the blinds, one was standing in front of him and Joey reached out. He thought his hand would go through and it did, but his hand and whole arm felt really cold, like he’d stuck it in the freezer. A few days later, a shadow came over to him and touched his arm. Joey’s forearm got so cold he got goosebumps right where the shadow’s hand grabbed him. It was a Friday and Aunt Amy was home early for once. Since she owned her company and since it was small, she was never home during the day and usually didn’t come home until six or seven at night, but today was different for some reason. Aunt Amy was a real math head but if she went grocery shopping by herself, she’d come home with nothing but junk food. Frozen pizza and corn dogs were fine by Joey, but Mom wanted him to eat healthy food (which meant Aunt Amy had to eat healthy, too), so she did the shopping or they all went so Mom could play Aunt Amy’s “enforcer” (that’s what she called Mom sometimes as a joke). That’s when he decided he’d better tell Mom. One of the shadows had just said “Dad” in his ear but the scariest part was that Joey recognized the voice. It sounded like Dad. He didn’t know what Dad sounded like until it said “Dad” to him. He still couldn’t remember what Dad looked like or anything else about him, but now he remembered his voice. Joey had a hard time concentrating on his math. Every time he heard a car drive by out front, he hoped it was Mom. He really needed to talk to her. He loved Aunt Amy, but for this, he needed Mom. He needed her a lot right now. He should have told her when he first started seeing the shadows. Now he was afraid it was too late. If his glasses weren’t working right, he didn’t know what he would do except go around with his sleep mask on all the time until Dr. Chandler could fix things. That’s why he had to see Dr. Chandler. She told him and Mom that his eyes might eventually adjust so that the prescription wasn’t as effective. Then she’d have to change his glasses so they worked better again. He wished he’d told Mom and that Dr. Chandler had already fixed his glasses. He was scared of what he was seeing and hearing and he was afraid he’d start remembering too, although he didn’t know why. He almost said no, but one of the voices said “Yes” in his ear. She stood up. They’d been working at the coffee table in the living room. She walked behind him and into the kitchen. They kept the aspirin, vitamins, band aids and other stuff in the pantry. He could hardly hear her because the whispers from the shadows (the whole room was full of them now) were so distracting. He was crying when Aunt Amy came back with two aspirins in one hand and a glass of water in the other. He had his eyes shut tight and his hands over his ears. The sound of the glass hitting the carpet and the water spilling made him look up at Aunt Amy. She looked pale and scared just like Mom did when they had that talk in the kitchen a few months back. “No wait!” Amy ran down the hall toward Joey’s room. Aunt Amy started to cough and then choke. “What’s wrong, Amy…” Then Mom tripped and fell backward. The shadows. They were attacking. Joey was letting them back into the world. “Son…help us. Don’t let them stop us this time. Ghostly hands reach for Joey’s face. Joey tried, but his Dad was too strong and he got his glasses away from him, throwing them across the room. Joey felt panicked. It was the worst kind of scared he had ever felt, but this wasn’t the first time. Right after his Dad died in the car crash two years ago he started seeing him and then he started to see the others, to hear them. Dad turned to the ghosts holding Mom. There were tons of ghosts holding her and Aunt Amy on the floor. It had been bad before but never this bad and it was all his fault. Somehow his eyes could see into the world of the dead but they let them back into the live world too. They wanted to kill Mom and Aunt Amy. Joey heard the whispers in his ear and now he knew there was never an operation. It was a trick. Dr. Chandler used it as an excuse to keep Joey blind while she was making the glasses for him. If his eyes didn’t see light, they didn’t open the door. He couldn’t see dead people and they couldn’t get to living people. He didn’t know why they couldn’t find their way home. Mommy didn’t understand and thought the ghosts, thought Daddy’s ghost was trying to hurt him, maybe even drive him crazy. Daddy would never hurt Joey but it did hurt because he died. Joey couldn’t stand it and couldn’t stand it and so that’s why he kept Dad from going away. But somehow that meant all the other ghosts who died after him couldn’t go away either. Mom took him to Dr. Chandler because she didn’t understand. She thought he was going crazy and that he might even be getting dangerous because he was seeing ghosts everywhere and scaring his friends. Everywhere that Joey went, at school, with his friends, at home, the ghosts could see, talk to, threaten, even beat up people. No wonder everyone who knew him from before was scared of him. He wanted to scream at the ghosts to leave them alone, to stop piling on top of Mom and his Aunt, to take their hands off of their noses and mouths so they could breathe. Joey could see their own ghosts getting ready to leave their bodies. He wanted to scream but that wouldn’t do any good. He had to find where the ghosts wanted to go. Why couldn’t he see it before? Dad’s ghost was shaking Joey hard. That’s why he couldn’t see it before. It wasn’t something outside of him or around him. Joey’s eyes were the door. When his Dad died and when his eyes changed he did something. It was all his fault these people were trapped and he had to fix it. The dead around him were talking all at once. They were getting closer to Joey as his Dad seemed to be getting further away. Joey’s Dad wasn’t there anymore and now some of the others were getting harder to see. They let go of Mom and Aunt Amy. Their own ghosts settled back into their bodies but they were knocked out. “Thanks, kid,” one of them said. “I’m sorry we hurt people, Joey. Tell your Mom,” said another. One by one the ghosts gathered around to look into Joey’s eyes. Even Joey wasn’t sure what they saw but whatever it was, it was enough. The eleven-year-old (his birthday was last week) mumbled something no one could understand but nodded “yes”. Dr. Chandler turned to Roger and the nurse slowly adjusted the valve. Janis, Joey’s Mom was standing on the other side of the bed. Sunlight was streaming into her eyes, so she kept them looking down at her little boy’s sweet face. She knew her sister and parents were waiting outside. Joey’s Dad’s parents were flying in from the coast. She hadn’t spoken to them since the funeral. Joey didn’t remember them after his Dad was buried. Roger moved over to the window and half closed the blinds. He looked right. “I see Mom.” He smiled. “Hi, Roger.” Joey tried to raise his hand but the IV tube got in the way and he stopped. “Hi, Joey.” Roger had a nice smile, the boy thought. Joey looked around. He could see Dr. Chandler, Roger, and Mom but there wasn’t anyone else in the room. He felt his face with his free hand just to make sure he wasn’t wearing his glasses. A week later, Joey had a late birthday party with all of his family and friends. He got lots of presents, but the best one was that he didn’t have to wear his glasses anymore and no one acted like they had to keep secrets from him or were scared of him. Mom would keep home schooling him until summer and then next year, he could go back to school again. That Fall, Joey started his first day at Middle School. It seemed strange to be one of the youngest kids. Instead of having one main teacher, he had a different one for each class. It took a few weeks, but he started making new friends and getting used to being just one of the gang. It was cold toward the end of October and he remembered he’d left his jacket in the library as he was getting ready to leave school for the day. He had to hurry because the bus was coming soon. Joey grabbed his jacket off of the chair where he’d hung it. He was putting it on when she spoke to him. He looked around but didn’t see her at first. He turned and had to concentrate real hard to see her. She was a shadow one minute and then she became clearer. I wrote this story based on this writing prompt yesterday, but something someone else wrote on their blog in response to their prompt, and a comment I made about it, gave me the idea for this story. It’s long, over 4,300 words, but I couldn’t say what I needed to say in a shorter tale. I know it’s more or less similar to the 1999 movie The Sixth Sense but I think it’s also different enough to be its own tale. I did a lot of imaginative work (meaning little to no research) so don’t ask me how the boy is the doorway into the afterlife for lost souls or how he got the vision in the first place. As I was writing this, I was stuck for a resolution. If this had happened to him before, why couldn’t he tell the dead people how to find the afterlife then? The answer is he wasn’t old enough to understand the solution. Dead Dad was the catalyst but also the only one standing between the rest of his family and the more radical and violent ghosts who’ll do anything including adding to their number, to find some rest. Fortunately, I was able to craft a happy ending. In one version, I had Joey blind himself to end the threat, but not only would that keep the ghosts from ever getting home, it would be a pretty gruesome thing for an almost eleven year old to do to himself. I think my final solution is more satisfying. Don’t you? 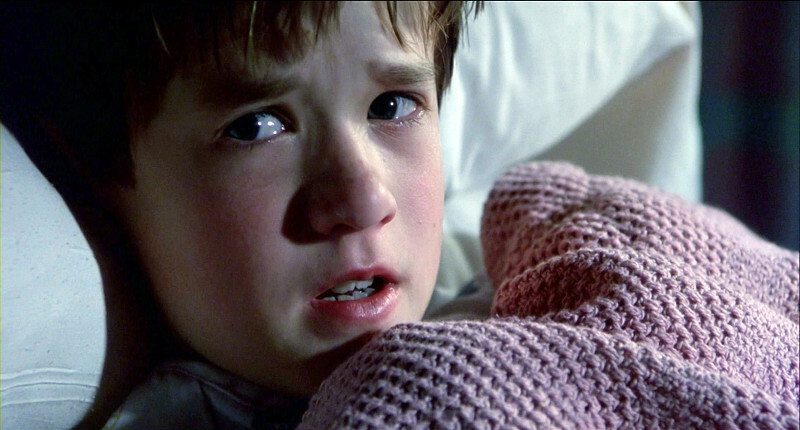 I saw the Sixth Sense and cottoned on to the ‘punch line’ pretty early on in the film. Interesting concept this. Our eyes are said to be the windows to the soul, so why not the afterlife? ‘Follow the light’ is often referred to for those passing over the threshold from one life to another, so again, why not see that light in someone’s eyes? Afterall, it is said when they die the light goes out. It makes you think James. Yes, it does though hopefully no child will have to deal with such difficult realities. Thanks. Just a bit over the 175 word limit, but well worth the read! I wrote a different story in response to the prompt. This one’s just for me and I didn’t put the link on Inlinkz.